Sign up to join our team of extraordinary volunteers! 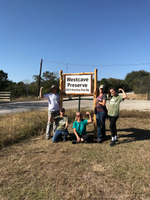 Our Preserve in Southwestern Travis County and Administrative offices in downtown Austin provide a wide variety of exciting and educational volunteer opportunities. Please fill out our volunteer form and we’ll contact you to find an ideal project that fits your interests and availability. Westcave relies on volunteers to support conservation efforts. Projects can vary widely, some examples are: land management, trail work, invasive species control, prairie restoration, various research projects, small construction projects or the weekday welcome desk (available seasonally). Our staff and volunteers have fun and work hard. If you are up for both, Westcave is your place, we welcome all levels of talent.